Over the past three weeks, Access Self Storage stores from across the nation have been receiving Easter egg donations on behalf of a number of charities. Access Self Store Northampton, Store Manager, Robert Samuel. A big thank you to every person or organisation who has donated to this wonderful cause. 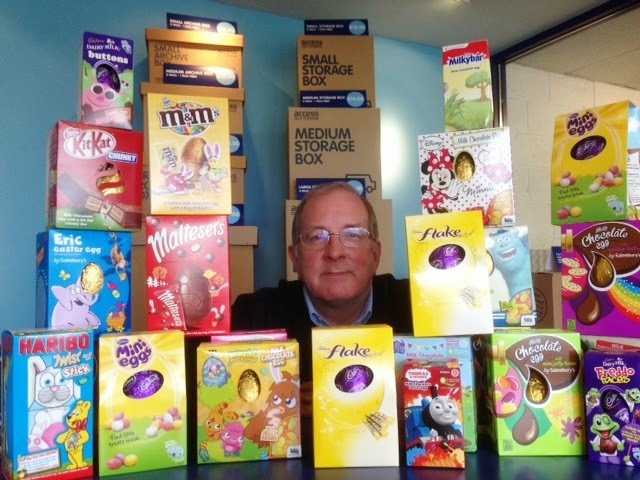 We are still hoping for an eggstra push at the following stores to achieve that lucky 100 eggs: Acton, Boston Manor and Ealing (for Acton Homeless Concern), Coventry ( for Tiny Tim’s Children’s Centre), Cricklewood (for The Children’s Society), Derby (for Rainbow Children’s Hospice), Kingston (for Kingston Food Bank), Portsmouth (for Rowan’s Hospice), Selly Oak (for Queen Elizabeth Hospital Charity), Southampton (for Rainbow’s Centre), Sunbury (for The Friends of Hounslow Portage) and Sutton (for Sweets for Life).